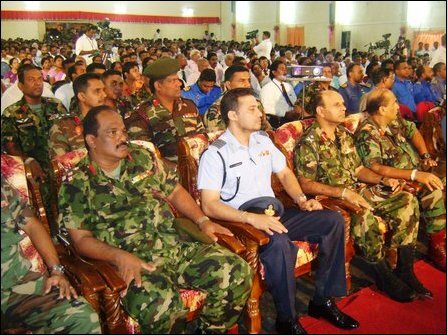 Sri Lanka president Mahinda Rajapaksa did not attend disaster management event (National Security Day), remembering Tsunami, took place this time in his colonial territory of Jaffna on 26th December. He was scheduled to preside over it according to earlier announcements. SL Prime Minister D.N. Jeyaratne substituted him and school students of Jaffna were ordered to ‘sing’ the SL anthem in Sinhala only for the occasion. The students clad in Tamil traditional dress, veaddi and chealai, said that they were never accustomed to sing the Sinhala anthem before, but were rigorously ‘trained’ in the last two days for it and were forced for the performance. The function, ignored by the public and participated mainly by officials, made SL minister Douglas Devananda to comment that public in future should be prepared for participation. The security for the event was such that when the lone UNP parliamentarian from Jaffna, Vijayakala Maheswaran tried to enter the auditorium, she fell down when the presidential security forces pushed her aside. Mrs Maheswaran, a native of Jaffna, had to be identified by a Muslim minister from the south before getting her permission to enter. TNA parliamentarians didn't attend the event. 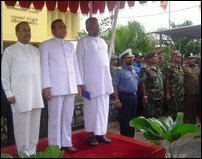 Speaking on the occasion, SL minister Mahinda Amaraweera said that the Sri Lankan government had built more than 100,000 houses for the Tsunami victims. But despite the lapse of six years, Eezham Tamils who faced the worst of Tsunami, especially in Mullaiththeevu and in Vadamaraatchi East, didn’t get what they should get in housing. To the end of the war, until they lost whatever little they had, they were living in temporary huts. The fund of several millions allotted for their housing has been reportedly returned without utilisation. Nobody talks about that now, said Tsunami victims in Jaffna. Similar to Tamil school children singing Sinhala anthem, Prime Minister D N Jeyaratne ritually read out a prepared text in Tamil. But nobody understood what he was reciting. The disaster management day was an occasion for praises of Rajapaksa, coupled with ‘cultural performance’ of exploited school children. But security was intimidating. Many media persons were not permitted to go inside. A few who were permitted were subjected to intense bodily search and search of their equipments. This was the predicament of government servants too. 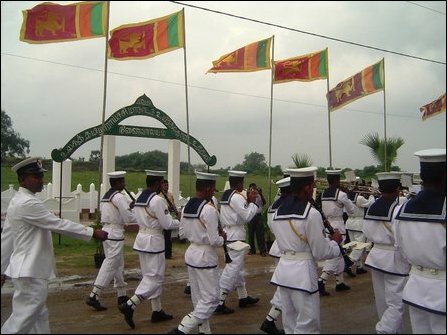 The next Tsunami-remembrance event will take place in Batticaloa, SL Minister Mr. Amaraweera said. Meanwhile, parents in Jaffna registered strong protests with the principals of schools against political exploitation of their children and exposure of them to security risks.